photowannabe: ABC WEDNESDAY LETTER " R "
ABC WEDNESDAY LETTER " R "
I would be REMISS if I didn't REMINISCE about our safari in the RIFT Valley of Kenya. The RADIATING RAYS of the early morning sunRISE made our team feel REVITALIZED. I love the RAMBUNCTIOUS baby RUMINANT giraffes. These are called RETICULATED giraffes for the pattern on their hides. If you enlarge this picture you can RECOGNIZE the drying umbilical cord coming from the newborn giraffe on the RIGHT. Now for a RANDOM change of pace. I thought the RAGGED ROPE dumped like RUMMAGE on the ROUGH RED brick made a RATHER interesting composition. I REALIZE I have shown pictures of the Golden Gate Bridge before but sometimes its fun to REHASH favorite topics again. This shot shows the REFLECTION of our RECENT RONDEVOUS at Fort Point for a family REUNION. Be sure to enlarge the pictures to get REAL detail.
" R " choices people have posted. I love your posts. They would make good vocabulary lessons. Always love the details of your photos Sue. Wonderful "R's".... I'm still working on mine and will post later today. 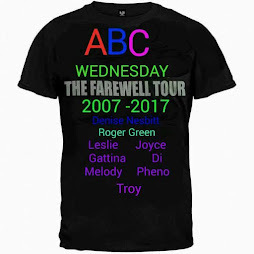 You are just the best when it comes to ABC Wednesdays.... Can't wait each week to see your collection. Terrific post for the R day! And what a great bunch of R photos! Love your composition! Hope you're enjoying a great week! Oh, I like all of these photos. What a gorgeous sunrise, and the baby giraffes are darling. Love the last shot, great reflection shot. wow, love the first picture! amazing! Gorgeous photos - all. The giraffes are adorable and your narrative is, as always, fine and fun! Always inventive in your approach! I love it all! Especially the rough red brick. It's always a pleasure to view your photos Sue - especially like the Fort Point one with the Golden Gate Bridge. A robust roundup of "r's!" Your photos provided a delightful armchair safari for a change of pace in the midst of a lovely and busy few days with new grandson and 2-year-old big sister. Much appreciated! Those rays are gorgeous and oh my goodness - those giraffes are too cute!!! loved learning words from you. What a great photo of that bridge! Definitely a different take. And the giraffes are so cute. This is a great post! I loved it. I particularly loved the rope - wonderful composition and collection of 'R' words, too! A great collection of 'R's! Wonderful pictures! I love that you put so much energy and thought into your posts. A photo safari would be an amazing trip! Although it's out of the ordinary, I love the rope shot! Thanks for sharing what looks like a great trip. Great R words, the early morning sunlight with the waiting cars is very atmospheric and who can resist a coil of rope. Oh my. That first picture took my breath away! Wow, you sure know how to make a bunch of R words work! I bet your safari in the rift valley of Kenya was WONDERFUL! OH The giraffes are adorable!! Loved your set of Rs! Awesome! What a great range of Rs! Love the photos as well! The rope did indeed make a very pleasing composition. Such fun!! Especially love the images from your African safari! Wonderful post; great vocabulary lesson for me :-) Photos are great. I like them all. And the Golden Gate is Red! Your photos are quite wonderful, I especially love the first one. And my word verification: redno. Your photos are very good. It's clever of you to find so many R words. Nice post with many well-chosen R-words and lovely shots.